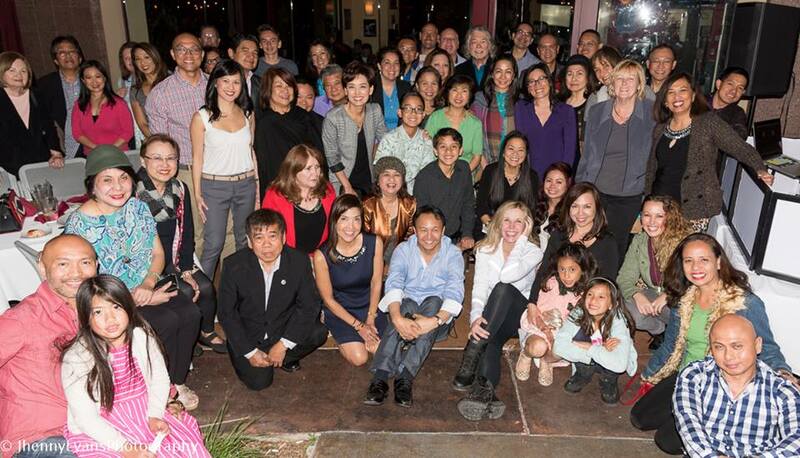 Thank you to all who had supported the independently-hosted event, “Warriors For Emma” last Friday night at Arte Cafe. In an intimate and emotional night, former Director and best-selling author Emma Tiebens had reminded us not to take anything for granted. “It was an evening that is forever etched in my heart! A night that oozed with love, friendship, compassion, inspiration and commitment to be part of a movement to give people the opportunity to choose to become Warriors For Energy, Meaning, Miracles and Awakenings in their own healing journeys. This was the first time – since the breast cancer diagnosis in December 2016 – that I was able to see my dear friends! It felt good to actually put a dress on, since I’ve been living in pajamas and sweats most of the time! As soon as I walked into Arte Cafe in Cerritos, CA, it felt so surreal.. This wasn’t my usual networking event.. this event was for me and every person here was my friend. Tears flowed as I saw each beautiful face and with with every hug I gave and received. I was humbled that people took time out of their busy Friday to be with me. The silent auction and raffle table was filled with wonderful prizes and there was a video and lights set up by my dear friend Ann DeVere and her daughter Deanna. Ann also donated the top prize for the evening – a $1997 ticket to her 2 day event “Turn Your Interview Into Cash”. Thank you also to Charles Nguyen, the “Smart Money Guy” himself, who helped capture videos and photos from the evening. It was clear that our esteemed hosts and organizers for the evening, FACCOC President and Realtor for ERA Realty North Orange County, Edwin Baloloy, President-Elect and State Farm Insurance Broker, Neil Estrada, Travel and Tour Director of Brighton Hotel Christine Consunji-Chen, and , Founder of CHHC Events, Helsey Lubiano, put a lot into preparing for this event! An epitome of, “Love is in the details.” It was also wonderful to see stellar photographer Jenny Evans and Nenita Miyata who captured priceless moments. Thank you to our DJ Ollie Estrada. I just bawled when I saw my dear, dear friends former California Assemblywoman Young Kim, who is currently running for Orange County Board of Supervisors and Yojie and Menard Leelin, co-Founders of Yojie Japanese Fondue and Leelin Bakery! Also my dear JoAnna Favis Pamaran, VP for US Bank, Leonard Mercado, co-Founder McCleod Realty (we missed you Mia McCleod) and Judy and Philip Winestone who were visiting from a Canada! Thank you also to FACCOC Board Members, Atty. Nate Epstein, Cristina Espirit, Linda Nguyen and Joel for helping with this event. Of course our Warriors For E.M.M.A. Evening wouldn’t have been complete without the Warriors who started it all – my friends Iron Eagle Mike and Nicole Parker, of Health Evolution, Raziel Arcega, of LNR Promotions, Aggie Kobrin of CEC Global Events, Barry Tydings of Veraxis Intl. JulieAnn Engle a holistic and naturopathic expert and Merina Ty-Kisera, acupuncturist at Merina Wellness. One of the biggest surprises for the evening for me was seeing my dear friend Pamela Donnely and her husband Simon Tresleyan who drove all the way from Malibu, CA to be with us. Pamela is the Founder of Valley Prep Tutoring and Creator of the GATE System which prepares any child to get to the college of their dreams! I was absolutely floored when Pamela told me and Garrett that she is gifting Garrett with the GATE System and her personal coaching to make sure Garrett has the top advantage to go to any college of his choice! Of course Garrett still needs to do the work. Thank you so much Pamela and Simon! I’m so happy to have been given some time to speak and personally answer questions and give and update on my situation. I will share that video shortly. I was so touched and oh so surprised when Garrett was the one to introduced me! So proud of you Garrett! Thank you and to all the generous donors of silent auction and raffle prizes! I will be requesting your names so I can personally thank you. As I write this from my iPhone, I see my friends’ beautiful faces and I’m re-living the beautiful memory of the evening! I’m sooo happy to see old friends and meet new ones! I’ll go out on a limb here to attempt to list my friends who were there from memory and without the list. Forgive me if I miss your name but know I will add it as soon as I get the list. The attendees were able to raise funds for Emma from donations, silent auction bidding, and opportunity drawings. Emma’s GoFundMe can be found here. Thank you to all generous silent auction donors: Nate Epstein, PJ Bestor, Charles Nguyen, Marlo Ryan, Ann DeVere and former State Assemblywoman, Young Kim. Raffle prize and cash donors: Raziel Arcega, Rico Bautista and Linda Nguyen, Cynthia Ruiz, Ellen Bitters, Mike Pestano, Neil Estrada, Garrett Tiebens, and Marie Kletke. 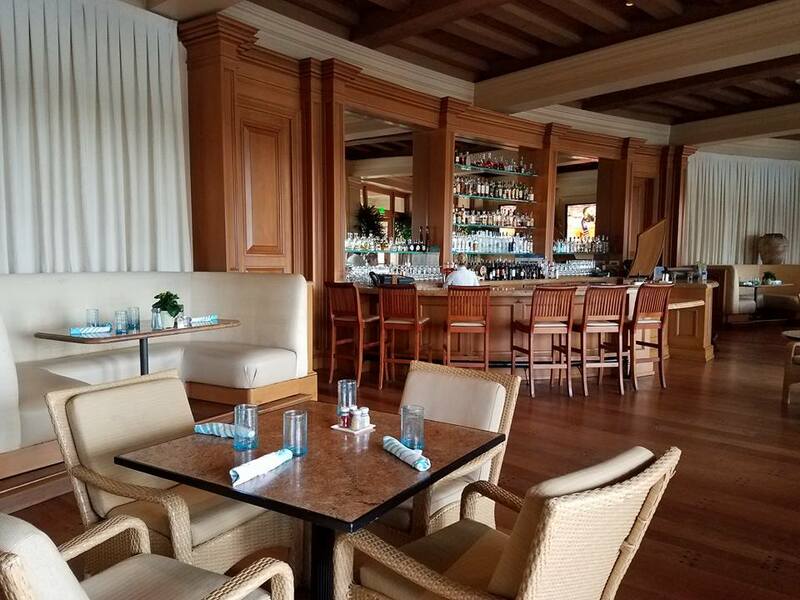 And to Arte Cafe for allowing us to use their luxurious venue and contributing a portion of the their proceeds of all food and beverages purchased. In segment 1, hostess G Tongi interviews President Edwin Baloloy and President-Elect as they describe the campus promotions and visiting the student organizations of USC, UCLA and Cal State Fullerton. The later segments featured our finalists, Anthony Garciano, Heidi Carreon, and winner Kevin Casasola. The segments of Anthony and Kevin will be added as Kababayan Today uploads them to YouTube. Incoming President Neil Estrada and FACCOC plans on continuing it’s support of local student leaders who are using financial aid and scholarships to fund their education. All finalists created 1-minute videos to highlight their accomplishments. 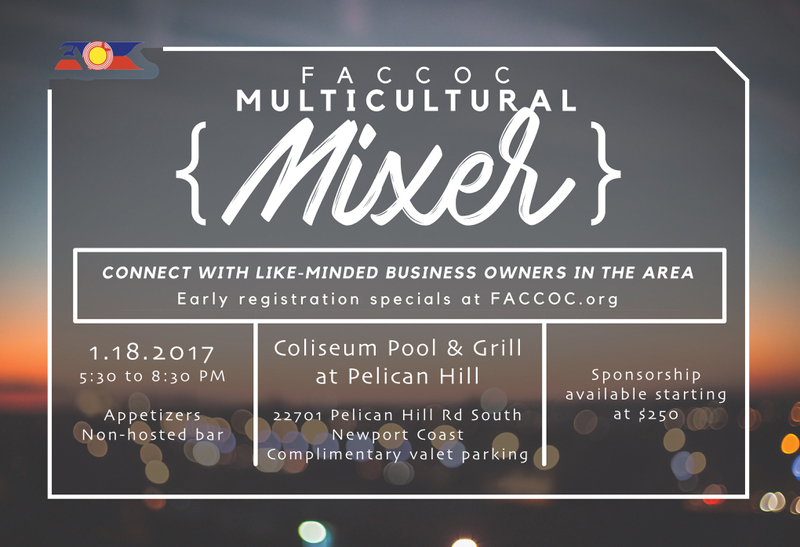 Register for our multicultural mixer. 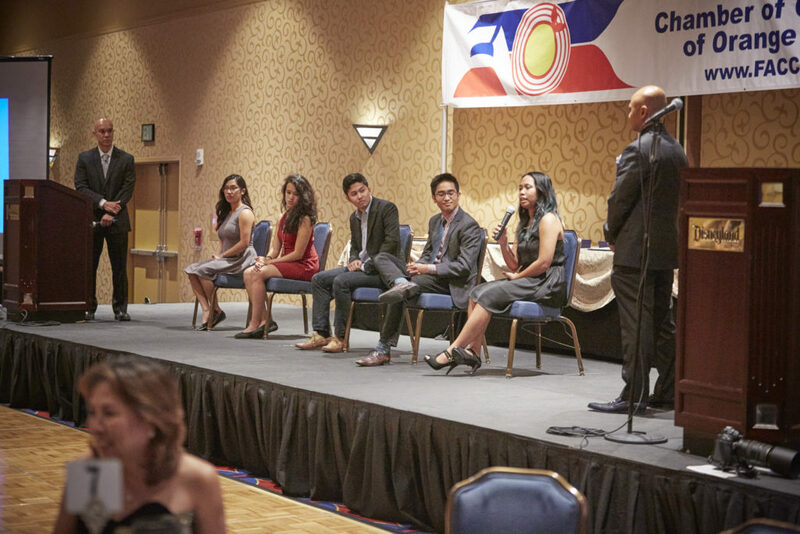 FACCOC had it’s first-ever “Fil-Am Scholar of the Year” award at it’s 2016 GALA “Generations” at the Disneyland Hotel. Student nominees (from left): Jacqueline Mayuga, Heidi Carreon, Anthony Garciano, Kevin Casasola, Celine Saludes. Startup Company of the Year Award was given to Joe Garcia of On Season Meals. 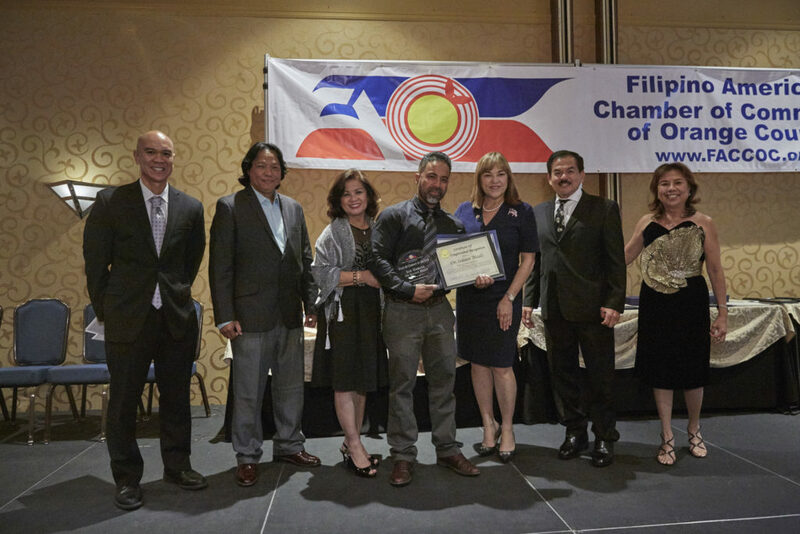 Joe Garcia (center with award) with Representative Loretta Sanchez, Dante and Fannie Cantal of Twin Eagles, and Wigsbert Mendoza of Metropolitan Water District. Corporate Community Advocate Award was given to Natividado Maneja of First Choice Bank. 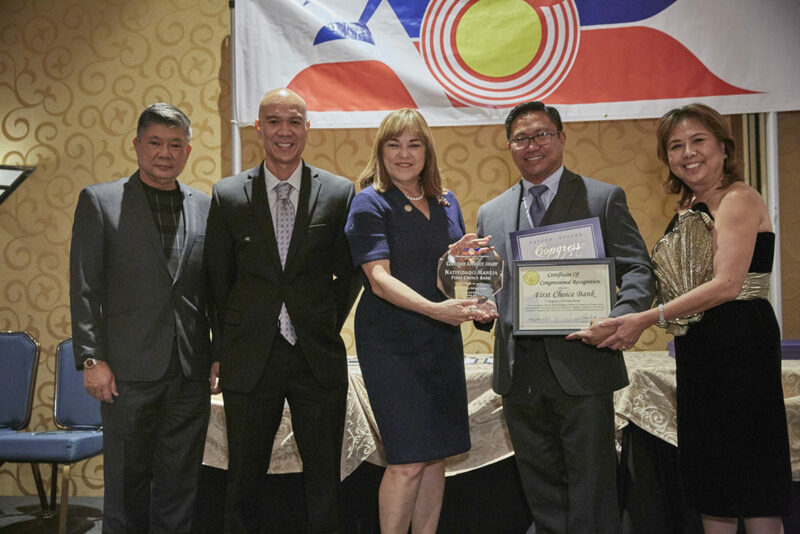 Natividado Maneja (Center with Award) with Rep. Loretta Sanchez and Menard Leelin. 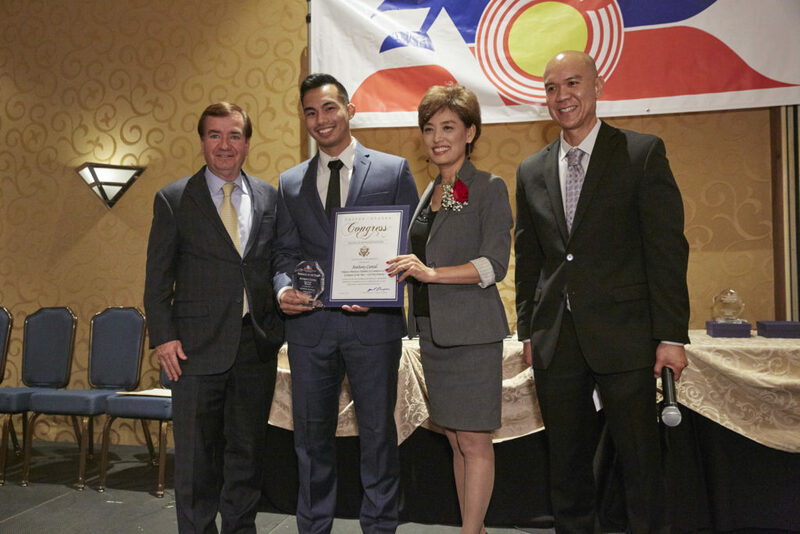 Graduate of the Year: Anthony Cantal of Cal Poly Pomona awarded on stage with Assemblywoman Young Kim and Rep Ed Royce. Special thanks to all who contributed in making this a special evening. US Bank, Western Union, and OCTA as corporate supporters and advertisers. Leelins Bakery, Dave and Busters, Center for Hope, Dalmacio Accountancy Group, On Season Meals, Gerry’s Grill, JB Diamonds, Lapid Foods, Cristina Espiritu of World Crave, and DT Limousine Services for their generous auction and raffle prize donations.